And if the Minnesota Duluth coach didn’t have something at stake in facing the upstart Minutemen in the Frozen Four championship game Saturday night, Sandelin would probably be rooting for them, too. “It’s a credit to them, their recruiting, getting players. Sometimes it doesn’t go that quickly,” he said of a team reaching the final in only its second NCAA Tournament appearance and just three years removed from a 5-29-2 finish. “It’s kind of a cool story to see teams take that step up. It gives hope for a lot of programs,” he added. It’s not lost on Sandelin, either, that his coaching career at Duluth began with a seven-win finish in 2000-01. Now he’s joined the likes of Herb Brooks and Bob Johnson in becoming one of nine coaches to reach four finals. By comparison, the Minutemen (31-9) have mostly a history of losing. Their 31 wins alone this year are 10 more than the school’s previous single-season best, and one more than UMass had in its previous three years combined. “I’ll share a secret with you,” Carvel said in explaining how in September he booked flights for his family to leave Saturday on its annual Florida vacation. The travel conflict didn’t hit Carvel until he woke up Friday — mere hours after Marc Del Gaizo scored 15:18 into overtime in 4-3 semifinal win over Denver — and scrambled to change the bookings. “It was the happiest $200 per flight charge I’ll ever make,” he said. 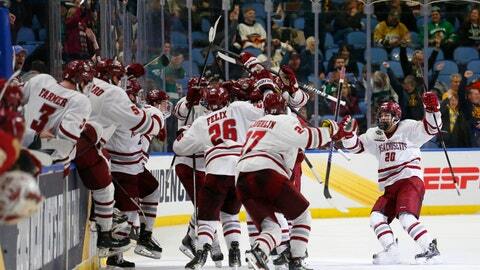 The first glimpses of the Minutemen’s turnaround came a year ago with a highly talented class of freshmen led by defenseman Cale Makar , one of three finalists to win the Hobey Baker award given to college hockey’s top player. Though expectations grew after a 17-20-2 finish last year, it wasn’t until UMass split a two-game series at then-top-ranked Ohio State in October when the Minutemen began realizing their potential. Senior forward Kurt Keats remembered the team’s mood in winning the first game 6-3. “We got up 3- or 4-0 early and we kind of came into the room and we were like, ‘Boys, we’re legit. This is the No. 1 team in the country and we’re taking it to them,” Keats said. Minnesota Duluth opened this year’s tournament by rallying from a 1-0 deficit to beat Bowling Green 2-1 in overtime, and then defeating Quinnipiac 3-1. On Thursday, the Bulldogs overcame two disallowed goals and killed off a two-man-advantage in the third period of a 4-1 win over Providence . NOTES: UMass forward Bobby Trivigno will not play Saturday after being suspended by the NCAA for one game stemming from his being ejected against Denver for an illegal hit to the head. … Bulldogs captain Parker Mackay will appear in his 14th tournament game, the most since four members of Boston College’s senior class in 2008. … Carvel has an opportunity to become the eighth coach to win the championship in his first appearance.